Our drainlayers are experts when it comes to unblocking your drains. 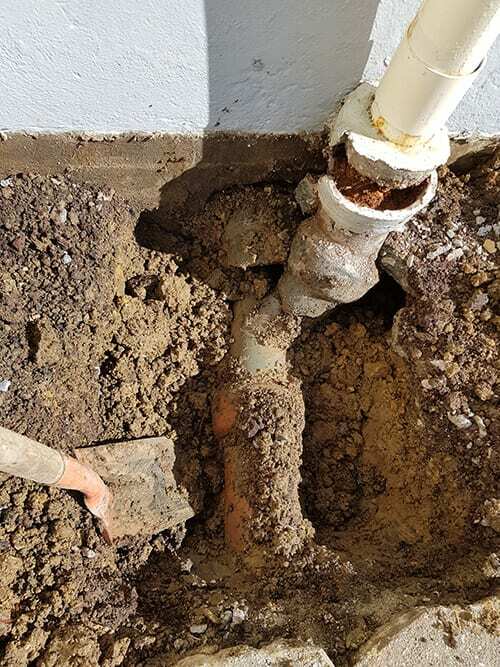 We see blockages on a daily basis and, most of the time, our experienced professionals are able to get your drains unblocked very quickly without charging you an arm and a leg. More challenging drain blockages will take a little longer but we have the tools and expertise needed to unblock your drains – no drain is too difficult. Operating across Wellington, get in touch for all your drainage needs. Why Call Complete Plumbing Solutions? We understand that there is a certain “ick” factor when it comes to blocked drains, but our plumbers aren’t afraid! Whether it’s a residential or commercial property, we are armed with the right equipment to efficiently unblock your drain – and we’ll do it tidily, without leaving a mess. We don’t recommend trying to unblock a drain yourself as an untrained hand can easily turn a small plumbing problem into a big one. Unlike our handheld tools we’d use for plumbing services under your sink or basin, blocked drains often require a little more machinery. Our drain unblockers make use of modern equipment that lets us send a steel rod with appropriate attachments into the drain to treat the problem. We can dislodge buildup of tree roots, clear the accumulation of leaves and muck and repair drain damage. Our efficient drain unblockers understand what is required to make an insurance claim when it comes to broken, blocked or damaged drains. We are here to help you through this confusing process. We are also happy to upgrade drains and cut roots that build up and get in the way, causing frequent blockages. Sometimes a job can be more complicated than you initially thought, but we always communicate clearly and get your consent before starting a major or timely repair or clean up.